You know, I think it’s really important that we understand the fear and the fact that everyone has shown up here in the last couple of weeks. It’s undeniable. Everyone here on this board works very tirelessly to do our, to have our responsibilities and sometimes being elected officials, you know, there’s good days and bad days and my point was slightly different than what the council has decided. 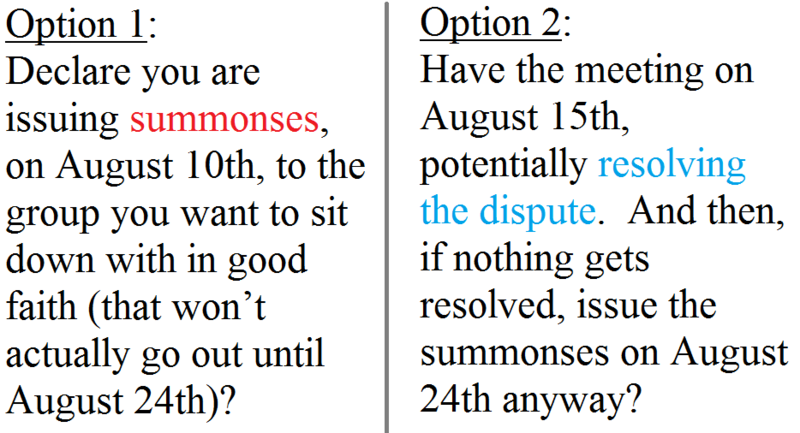 There have been negotiations if you will, conversations with the Monsey group, with our assemplywoman Holly Schepisi, myself and for some parts, the Council President, where we tried to understand, is there a better way to do this? 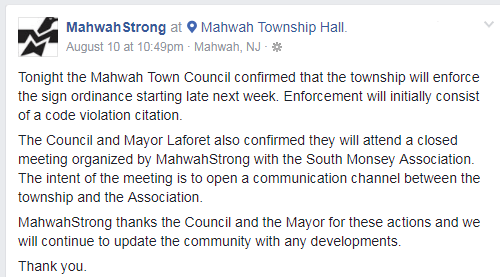 It’s important for you all to know that there’s a scheduled meeting for Tuesday evening at, here at the town hall where we will bring in the Monsey Eruv group which si the first time this committee has an opportunity to hear from them, and members of Mahwah Strong and our attorney and a few council people to talk about: is there a solution? Is there a way to fix what’s broken? They admit that they did this in the wrong way. I believe that there will, there’s no clear solution here. One of the potential, and this is not the fear, but of the potential, the worst case scenario is what happened in Tenafly. Approximately a $600,000 lawsuit that they lost. I’m concerned that our actions will prompt some action in the Federal Court. That the two week stay is really worth the journey. If we are assessed with a lawsuit of that kind normally we have what’s called JIF and MEL insurance, our insurance carriers would cover us in the eventualities of lawsuits for various things. But we as a community would not be covered for this liability. I’m not going to say that it will come to be because we will hire the very very best and talented attorneys if we are faced with that. We are united in the fact that we are here to solve a very difficult, very sensitive, very emotional problem. My continue was that we simply give these conversations an opportunity to play out for the next two weeks and then decide what we do. So, what is the response to this sensible suggestion by Council President Rober Hermansen? 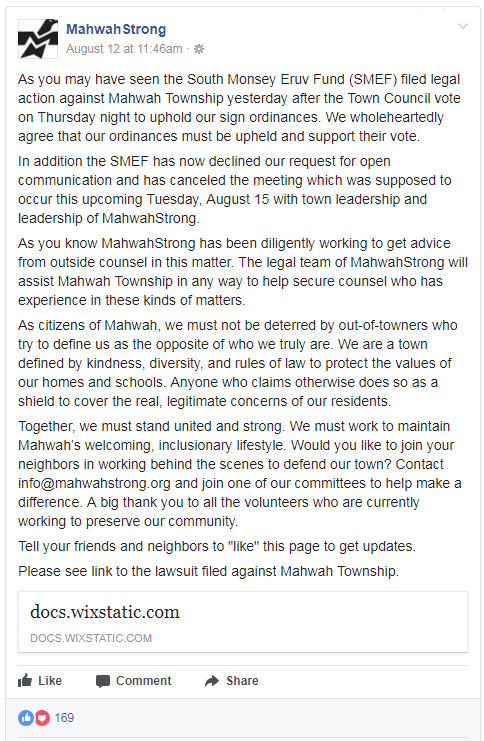 This is not an easy issue obviously… We have got to make decisions that we think is in the best interest of the township of Mahwah and not for Rockland County. What I found out over the last couple of days, and where we are, is that one of the problems that we have and why this pvc pipe went on and that’s what it is, it’s pvc pipe, it is put up by someone without permission of the township…. We have found out that the reason why they have chosen the townships that they have is to enclose for Rockland County because Rockland County does not have enough poles in order to enclose the area that they want to. So they have used and come in to Bergen County to do so. My point is that this is a Rockland County issue. And this is where it should be settled. Rockland County should take care of their own problem. Watch the video for yourself if you have any doubts. When faced with the challenge by the Mayor that this would destroy any chance at meaningful negotiations, the response had NOTHING to do with the ability to negotiate. There was no desire to negotiate. There was no desire to talk at all. To Robert Hermansen, this was never about an Eruv. 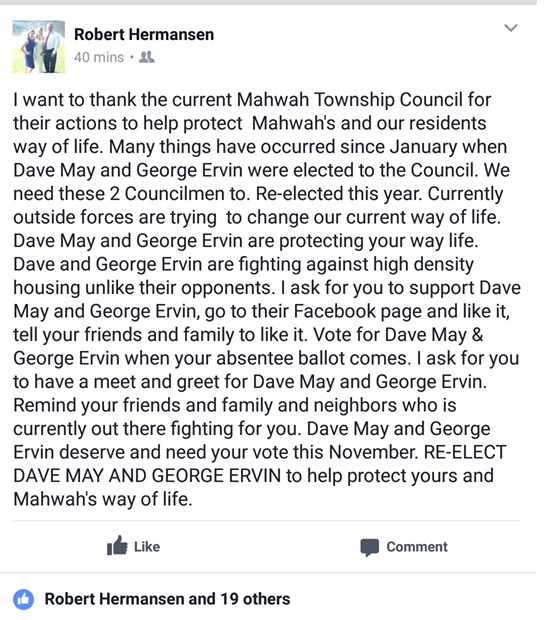 This is about restrictive zoning laws to keep out people he finds undesirable, or as he puts it, “to help protect yours and Mahwah’s way of life”. Robert Hermansen on protecting their way of life. The message was not universally received that way however. And then, the inevitable happened: Litigation commenced. The Township unilaterally blew it up. The other side didn’t see any point in showing up to a negotiation without a modicum of good faith.